Cigarette Smoke Detector - STEALTH smoking enforcement with alarm, wireless, wired alerting cigarette smoke detector options. Sales and manufacturing of cigarette smoke detector for bathroom. Finally! An Effective Solution to STOP Smoking Policy Abuse & Catch Smokers in the Act! Pays for itself in less than 6 weeks! Stealth Smoking Enforcement Systems are ideal for stopping smokers in areas designated as smoke free such as bathroom or stairwell. Proven results for over 10 years - tailored specifically to schools, hospitals, nursing homes, apartments, vehicles, offices, and more! Cigarette Smoke Detector can be used alone or equipped for wired, wireless, or Wi-Fi notification. 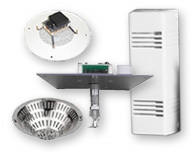 Choice of alarm, strobe light, voice, pager, email, or text message output options from your cigarette smoke detector. Our system selection guide can help you choose which cigarette smoke detector system and which stealth cigarette smoke detector options are right for you. We manufacture and offer direct sales of all our cigarette smoke detector products and smoking enforcement systems. Contact us We'll make the choice clear. Be alerted instantly anywhere, anytime! Place a cigarette smoke detector inside each bathroom that is of concern. The cigarette smoke detector is triggered immediately as the smoker lights a cigarette in the washroom. The cigarette smoke detector can sound an alarm inside the bathroom, or alert you anywhere, anytime! Horn, strobe, pager, cell phone, email - it's your choice! us to learn how a cigarette smoke detector can eliminate cigarette smoke and smoking in your washroom today! Be alerted instantly anywhere you are!